My daughter left her “notebook” on the desk in our home office the other day, and I picked it up to and flipped through it. Just to clarify, this was just a notebook and not a diary. Therefore, I did not violate her privacy. The notebook is one that she uses to write down quotes. Kendall loves quotes. She loves quotes A LOT. So much so that she constantly feels the need to share them with friends and family. When I say constantly, I mean constantly. And because the quotes are constant, I don’t always pay that much attention. One of her favorite quotes was highlighted. “That’s always seemed so ridiculous to me, that people want to be around someone because they’re pretty. 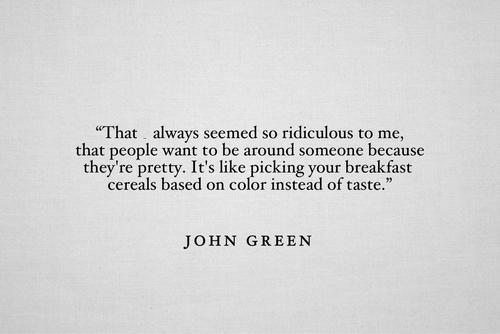 It’s like picking your breakfast cereals based on color rather than taste.” John Green. Reading that quote makes me smile. Knowing that my daughter is not a superficial person makes me smile even more. Posted on December 11, 2013, in Family, My life, perspective and tagged 365 reasons to smile, books, children, life, musings, perspective, quotes, smiles, Thoughts. Bookmark the permalink. 32 Comments.